1944 was a pivotal and very productive year for Wegner in which he produced the Fish Cabinet, Peter’s Chair and Table, the China Chair and his second rocking chair, J16. The Fish Cabinet and J16 are diametrical opposites and demonstrate the scope of artisanship that Wegner commanded. When comparing the two pieces, the Fish Cabinet’s pictorial art theme, richness of detail and intarsia work (pictorial wood-inlay) stand in sharp contrast to the gentle, simple and unadorned expression of J16. The Fish Cabinet is the result of an ardent, artistic urge to create an expressive piece of furniture, while J16 is a chair that came into being as the result of rational decisions regarding materials, function and means of fabrication. produce good quality affordable furniture. Therefore. J16 was simplified so it could be sold as cheaply as possible. The wood chosen was beech. It was Danish, strong, inexpensive, and easily available, thus avoiding the hurdle of having to import timber during World War II. 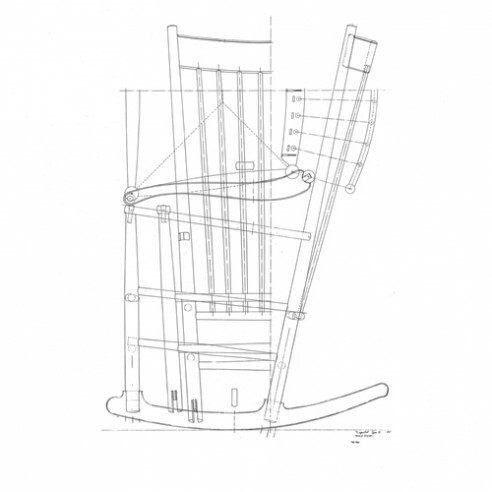 In common with his later designs for Carl Hansen such as chairs CH36 and CH44, J16 was inspired by the aesthetically simple, self-produced furniture of the American Shaker community. Some believe that the Shakers were the first to develop rocking chairs as a furniture type. It was their religious duty to maintain a healthy body and making things by hand was a way to ‘actively’ relax in a healthy and useful fashion. It was also Wegner’s intention to keep a person from becoming too sedentary while seated. While he didn’t emphasize the chair being able to rock as a primary function, this rocking chair was ideal for shifting body position, giving its user great freedom of movement. J16 has been in continuous production for over 70 years since launched by FDB in 1944. To enhance sitting comfort FDB later supplied the chair with seat and back cushions. A footstool and pillow were designed on the occasion of the chair’s 50th anniversary. Wegner’s rocking chair reached a worldwide audience. According to a Danish newspaper article from 1974, it found a home in both the White House and the pope’s residence in the Vatican.